This piece of Inuyasha x Ayame or InuAya and fan kids fan art is dedicated to Mi-Na-Tsuki, DankMemeBirb360, and Managodess who celebrated their birthdays two days ago. So, I hope you guys had amazing, awesome, wonderful, and grand birthday celebrations. I wish you a lot of love, joy, abundance, and prosperity in your lives as artists and as people. Wie wir auf deutsch sagen, ich hoffe ihr habt tolle, hervorragende, wunderbare und grandiose Geburtstagsfeier. Ich wünsche euch viel Liebe, Glück, Reichtum und Wohlstand in euren Leben als Künstler und als Menschen. This also dedicated to all of the InuAya shippers out there. So, sit back, relax, and soak in that Inuyasha x Ayame goodness. Here we have, from left to right, 35 going on 36-year-old Inuyasha, 32 going on 33-year-old Ayame, and their two pairs of eldest twin sons. The first eldest twin sons are 17 going on 18-year-olds Masataka and Masaya. The second eldest twins are, of course, our beloved 16 going on 17-year-olds Kenta and Keita. Sure, I would have loved to add in the other younger siblings namely Kaito, Momoko, and Maya, thus making Inuyasha and Ayame have a grand total of seven children, but there was not a lot of space, so I will definitely add them, as I make the InuAya family tree in another submission. 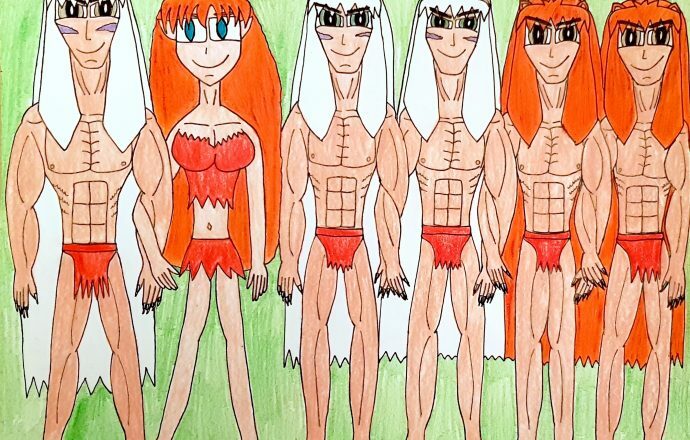 We already got to know Kenta and Keita, the second eldest muscle twins, so, let us be acquainted with Inuyasha’s and Ayame’s first eldest muscle twin sons, Masataka and Masaya. Inuyasha and Ayame always knew they were meant for each other, even before they ended up married when he was eighteen and she was fifteen. As they consummated their feelings for each other one night, Ayame discovered that she was pregnant with their pups. Her grandfather saw that Inuyasha was a lot more fit to be Ayame’s husband than Kouga or any other warrior, especially when he saved the Northern Yoro Tribe from a vicious, hulking horned demon by using his brute strength and claws. So, she and Inuyasha ended up being married complete with a great feast and nine months later, Masataka and Masaya were born. Masataka and Masaya were born with a mixture of their parents’ eye colors and with purple jagged stripes on their cheeks much like their father when he turns into a full yokai. Masataka and Masaya are the split images of their father with a few hints of their mother’s determined, focused nature. Much like their younger brothers Kenta and Keita, they have a responsibility to uphold as heirs to the Northern Yoro Tribe. Masataka and Masaya have inherited their father’s brute strength, relentlessly fierce fighting prowess, toughness, and willingness to be stronger warriors ever. Masataka, Masaya, Kenta, and Keita would always train their bodies, minds, and spirits in order for them to fight alongside their father, mother, and younger siblings. Every sunrise, Inuyasha would enter Masataka’s and Masaya’s room and greet them with a bellowing roar while beating his chests. As the eldest twins wake up, Inuyasha would flex his muscles, thus having them being greeted by his strong, battle-hardened glory. Masataka and Masaya would approach their father and flex their muscles back at him. A posedown and, eventually, a wrestling match would ensue with the eldest twins giving Inuyasha a great bear hug and vice versa. 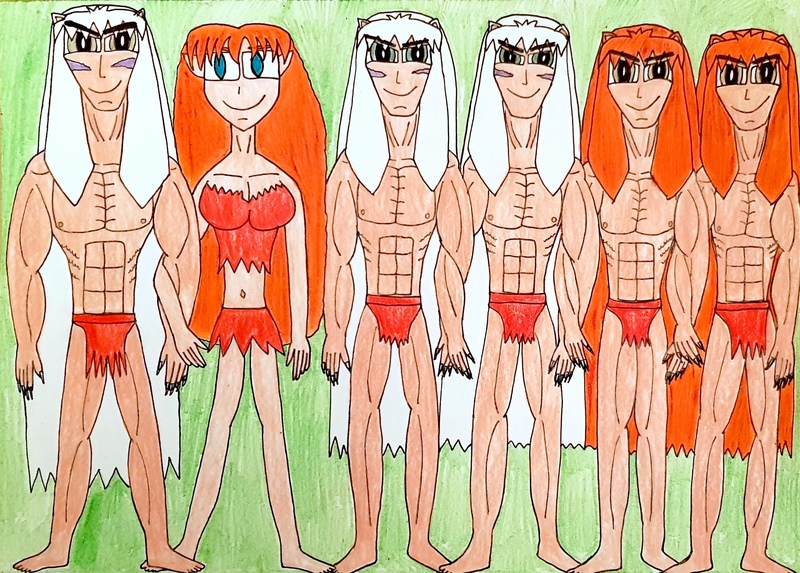 After that, Inuyasha, Masataka, and Masaya would go to Kenta’s and Keita’s room and greet them with the usual ritual of flexing their gloriously well-toned muscles, having a wrestling/boxing match before and after breakfast, and the culmination of them having a laugh. In terms of distinguishing their personalities, Masataka is the calm, cool, collected brother while Masaya is a bit on the rowdy side but still has enough gentility and sense of responsibility to make him all the more valiant. However, one must be careful never to push their buttons, as Masataka and Masaya can get easily angry, thus turning them into full-fledged yokai with flashing, fierce red eyes, using their brute, musclebound strength, steel-like claws, and mighty fists to crush their enemies, and wrapping everything up with a victory roar that could give any lion or tiger a run for his money. Masataka and Masaya love to go swimming, take quiet walks in the forests, and train by weightlifting, wrestling, boxing, and doing a lot of martial arts that involve punching, kicking, and using their claws. In terms of individual activities, Masataka always loves to gather berries and edible flowers while Masaya loves to hunt for deer and boar. Masataka, Masaya, Kenta, and Keita always look up to Inuyasha as their role model and Inuyasha considers all four of them to be his most favorite sons. Moreover, Masataka’s and Masaya’s brotherly relationship with Kenta and Keita is really akin to all four of them being the best of friends because of their wonderfully strong bond as brothers. Due to their strong personalities, they do tend to argue and have the usual competitions of muscles and strength. One has to leave it to Inuyasha who enters with a huge roar gives Masataka, Masaya, Kenta, and Keita bear hugs, full nelsons, and/or sleeper holds and Ayame who elicits a stern, commanding presence while cracking her knuckles and snarling for them to stop fighting. At least with Masataka and Masaya, they are the calmer and more rational of these set of twins, as they know how to help Kenta and Keita out in sticky situations. Kaito, Momoko, and Maya are even attached to their older brothers with Kaito enjoying the company of Masataka and Masaya and looking up to them as his role models, as they are not only protective of him but also gracious and playful with him, and Momoko and Maya having a lot of fun with Kenta and Keita in terms of their dashing, charming, funny personalities with the occasional showing off of their muscles and strength to amuse them. Overall, Masataka, Masaya, Kenta, and Keita really do care for each other, their younger siblings, and their parents through thick and thin. I hope you all enjoyed having a gander at Inuyasha’s and Ayame’s first eldest twin sons, Masataka and Masaya, as well as seeing them with their dear younger brothers, Kenta and Keita. See you all in the next submission and take care. Masataka, Masaya, Kenta, and Keita belong to me.